The following report has reference to improvements made on the farms of Ramslacks and Balleny, in the parish of Currie, and county of Edinburgh, and especially in regard to the reclamation of 60 acres of waste land, part of Ramslacks. I obtained a lease of the farms for nineteen years from Martinmas 1862, from Ralph Erskine Scott, Esq., trustee for Carteret George Scott, Esq. of Malleny, the then proprietor, and, owing to the bankruptcy of the out-going tenant, I got possession in April preceding. Ramslacks contains about 230 acres imperial. Elevation above sea-level about 800 feet. At the date of my entry it was an open muir, apparently in its natural state, without fences and unenclosed, except by the boundary walls on the north and south sides, and, with the exception of about 20 acres, covered with heather. Patches of the land had, at a remote period, been under cultivation, and 60 acres, now enclosed as two fields, had never been ploughed. The value of the land at this time will be afterwards given. Balleny contains 160 acres imperial. Elevation above sea-level about 700 feet. This farm had been wrought as an arable farm, was enclosed in small fields of from 5 to 15 acres, and was in a wet, sour state for want of drainage. 1. Trenching.—A good deal of trenching was necessitated in removing a great many of the fences, with a view to enlarge the fields on Balleny to from 20 to 30 acres each. 2. Drainage.—I drained the whole of both farms, excepting 40 acres having a light soil, about 18 feet apart, and from 3½ to 4 feet deep. These 40 acres were drained 30 feet apart, at the same depth. Average expense of drainage per acre, L.6, 10s. Total expenditure, exclusive of cartage, L.2502, 10s. 3. Liming.—200 acres of the farm of Ramslacks have been limed with 7 tons to the acre. Expense about L.5 per acre. 4. Fencing.—The land of Ramslacks is now properly enclosed, being divided into six fields, three of 50 acres each, one of 15, and the 60 acres of reclaimed land into two fields of 30 acres each—5 acres being under plantation. The fencing put up being fully 60 chains of dry stone dykes, 5 feet in height, built with the stones cleared out of the reclaimed ground. Expense of building, 16s. a chain, and 86 chains of wire fencing at 7d. a yard. 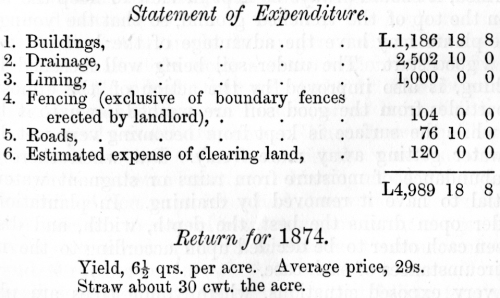 Total expenditure for division fences on the farm of Ramslacks, L.104. I may here add, that the proprietor completed the enclosure fences shortly after my entry. Details of Operations on Sixty Acres Reclaimed. Soil.—The greater part of the soil is heavy, with a tough clay subsoil; the remainder, about 10 acres, is light, with a freestone bottom. State of Land previous to Improvement.—The land was tufted with short scroggy heather and bent, thickly interspersed with stones, a great many requiring to be blasted before removal, and full of holes and deep ruts, caused by the action of the weather, the holes generally standing full of water. It was then valueless, and would not have afforded sustenance to half a score of sheep, and if let by itself would not have brought L.3, being less than 1s. an acre. The draining and liming completely changed the seeming poorness or unproductiveness of the soil, and it is now capable of carrying fair crops. Fences and Road Malting.—In 1865 I commenced to blast and remove the stones for building fences and making roads. The dyke dividing the two fields, extending to 28 chains, was totally built of the stones gathered from the land. Expense, 16s. per chain. A road, 30 chains in length, leading from the steading to these fields, was also made with the stones taken from the reclaimed land. Expense of breaking stones, 11s. per chain. Total expenditure of these 30 chains, L.16, 10s. There were in all, as already stated, 60 chains of 5-feet dykes built on the farm of Ramslacks with the stones got from the land brought in; and in addition to these dykes and road, the stones gathered from the land were also used for making roads on other parts of both farms. In 1866 the land was drained—the clay or heavy soil 18 feet apart, and the free or light soil 30 feet apart, both at the depth of from 3½ to 4 feet. First ploughed in 1866-67, just as I found time. In 1868 I planted 10 acres with potatoes, with about 4 cwt. of bones and 3 cwt. of guano to the acre. The expense of seed and manure was L. 6, and the yield about 14 bolls an acre; sold at L.l per boll. In 1868-69 the whole ground was ploughed up and sown with oats; yield, 4 qrs. to the acre on the 10 acres previously cropped with the potatoes, and a quarter per acre on the remainder; value, 23s. per quarter. The land was ploughed in the winter of 1869; limed in the following spring with 7 tons the imperial acre, and reploughed and prepared for and sowed with turnips; manured with 4 cwt. of bones and 3 cwt. of guano per acre; yield, about 15 tons per acre; crop used on farm. In 1871, ground again ploughed, and sowed with oats and grass for hay; crop about 6 quarters per acre; straw heavy; price of oats 25s. per quarter. Hay crop following season; about one ton and a-half the acre; sold at L.3 a ton. 1873, pastured. 1874, oats; manured with 1 cwt. of guano and 1 cwt. of nitrate of soda an acre. Crop good, but still unthrashed. I think, from the bulk of the crop, the yield will be 6 quarters an acre. Weight of small quantity thrashed, 41 lbs. per bushel; which was sold at 28s. 6d. per quarter. Straw heavy.